When you're done eating all that turkey, you'll still need some great recipes to use up the leftovers. 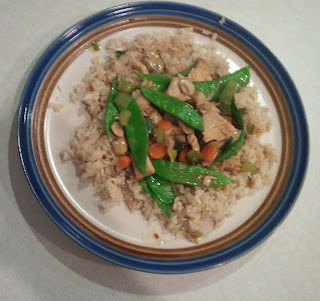 Here's one of my favorites - Turkey with Snow Peas! Make the cooking sauce: In a medium bowl, mix the broth, soy sauce, garlic powder, ginger, and red pepper flakes together. Set aside. Make the thickening liquid: In a lidded plastic bowl, put in the water and cornstarch. Put the lid on the bowl and shake until the cornstarch is thoroughly mixed with the water. Set aside. In a large skillet, heat the canola oil over medium-high heat. Stir fry the scallions for 1 minute. Add the celery and carrots and continue to cook, stirring often, for 3-4 minutes. Add the green or red pepper and continue to cook, stirring often, for another 2 minutes. Add in the cooked leftover turkey and mix together. Turn heat to high and add cooking sauce. Once the sauce comes to a boil, turn heat down to medium-low and simmer for 5 minutes. Turn heat back to high and add thickening liquid. Continue to cook, stirring, until the sauce has thickened. Turn heat back to medium and add snow peas. Cook for 1 more minute or until snow peas turn bright green. Remove from heat and serve over a bed of brown rice.